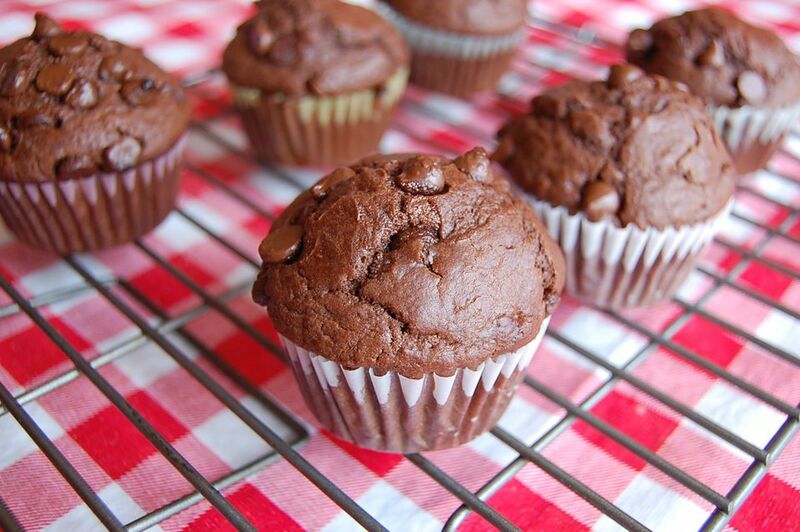 If you love chocolate, you'll love these double-chocolate muffins. Made with cocoa powder and semi-sweet chocolate chips, they'll satisfy even the most serious chocoholics. The key is is sprinkling additional chocolate chips on top before baking. Muffins are actually a form of quick bread, meaning that they have a bread-like texture but are made without yeast. Baking powder is the secret to making quick bread rise. It has only been available commercially since 1857, but quick bread and cakes have made it an indispensable pantry staple. If your muffins will be eaten at home by family members, appearance may be a secondary concern. But if you're baking for a special event (or bake sale), muffin liners can make your delicious treats as pretty as they are tasty. Muffin liners are corrugated cup-shaped paper or foil liners that you put into each muffin tin before adding the batter. This recipe calls for a combination of butter and oil, which means you get the best of two worlds. While butter has a wonderful flavor, it can produce a dry muffin. Oil, on the other hand, has little flavor but helps ensure that your muffins are moist. In a large bowl, combine the flour, cocoa powder, sugar, baking powder, and salt. In a medium bowl, combine the milk, and the melted butter. Then add the oil, whisk in the beaten eggs, and stir in the vanilla extract. Thoroughly grease and flour a muffin pan (or better yet, you can use paper muffin liners). Add the liquid ingredients to the dry ones and mix no more than 10 seconds. The batter should be visibly lumpy. It's extremely important not to over-mix the batter, or the resulting muffins can be hard or misshapen. With a rubber spatula, gently fold 1 cup of chocolate chips into the batter. Don't overwork the batter. Carefully spoon the batter into the prepared muffin pan (you can use a small ladle or even an ice-cream scoop). Sprinkle the remaining chocolate chips onto the tops of the muffins, and transfer to the oven immediately. Bake 18 to 20 minutes or until a toothpick inserted into the center of a muffin comes out clean. Remove the pan from the oven and let the muffins cool for five minutes in the pan. Then remove the muffins from the pan and let them cool another five minutes on a wire rack. The dry and wet ingredients, respectively, can be mixed in advance, but as soon as the wet and dry ingredients have been combined with each other, the liquid will activate the baking powder and the batter needs to be baked right away. If you run into problems removing your muffins from the pan, run a butter knife around the edge of each muffin. Then cover the muffin pan with a clean towel and flip the pan. Your muffins should pop out into the towel.